Hi guys! 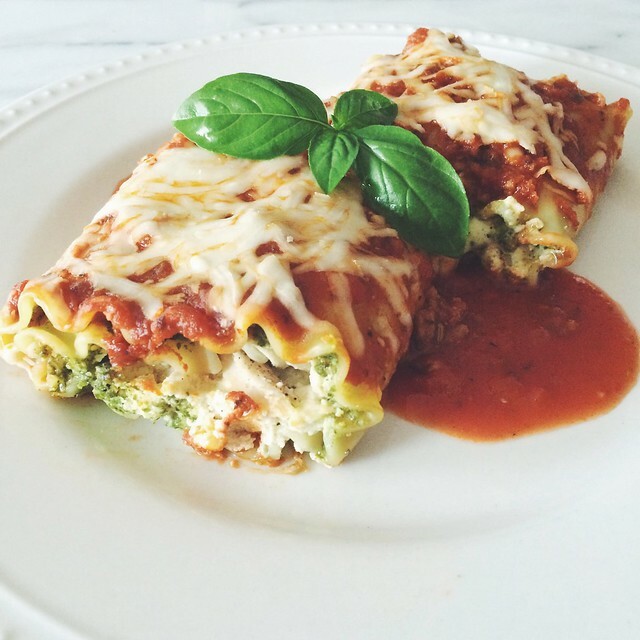 I realized yesterday, after making dinner, that I owe you guys sooo many recipes so I'm going way back with bringing you this Easy Pesto Chicken Lasagna Roll one. I made this while I was pregnant with Vivi and I have to say, it was SO easy to make. Granted, I did turn the recipe that I found for it into a more semi-homemade dish. Let me just say that I did have the best intentions of making my own pesto sauce, but I remembered while grocery shopping that our food processor is broken (womp womp), so I had to scratch that idea. BUT, I'm happy to say that the fresh pesto sauce from Whole Foods is delicious and worked perfectly in this dish. More recipes are coming, I promise! But in the meantime, enjoy this one, it's definitely one to add to your weekly rotation! Recipe slightly adapted from Baked By Rachel. - Boil 10-14 lasagna noodles as directed on the packaging. - Cook chicken breast to your desired method. I chose to oven bake it at 375 degrees for 25 minutes. I also pounded the chicken to ensure that it cooks evenly and quickly. If you're really in a pinch for time, I'd say get a rotisserie chicken instead of cooking the chicken breast. - In a medium bowl, combine the ricotta, egg, parmesan cheese, salt, & pepper. - Drain the lasagna noodles. - Spread some of the tomato sauce on the bottom of your rectangular dish, just enough to coat. - Now to create the rollups, spread about 1tbsp of pesto sauce on a lasagna noodle followed by the ricotta mixture and then the shredded chicken. Then roll the noodle and place it in the baking dish. - Keep repeating the above until you've filled the dish. I had enough ingredients to fill a 13"x9" rectangular dish and half a 12"x12" glass dish. It just all depends on how filled you want these rolls. - Cover the rolls with the tomato sauce and then top it with the shredded mozzarella. - Bake for 30 minutes or until the cheese is melted. Thanks for sharing an amazing cickhen recipe.